Stephanie received a BFA from Rhode Island School of Design majoring in Illustration. She is a life-long resident of Southeastern Massachusetts, and is influenced by the variation in landscape that New England offers. Her love of trees and the many changes they undergo through the seasons provide new inspiration daily for her landscape collages. 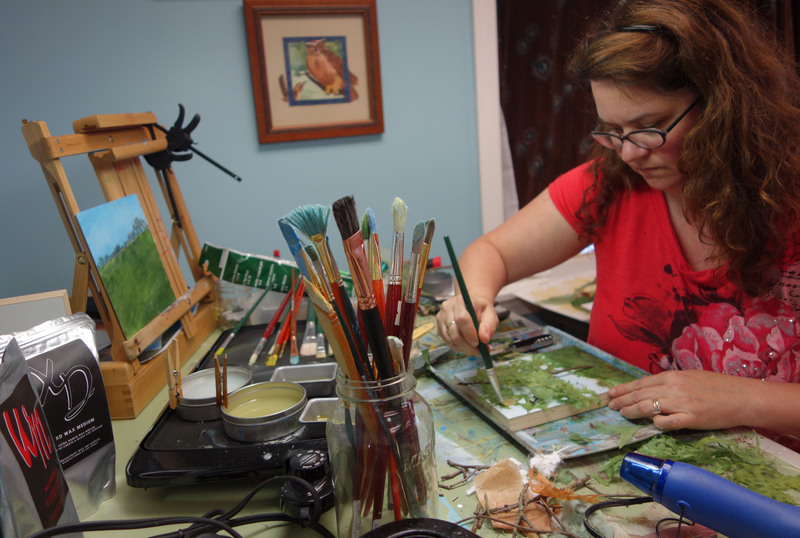 Her chosen medium is mixed media collage, “I work in collage because I am a maker; I enjoy the process and tactile experience involved with assembling to create while appreciating the forgiveness and immediacy of collage. I use many different kinds of paper but rarely in their original form, painting or staining to accentuate the natural texture or create pattern and texture where there is none.” Her incorporation of branches she has collected into her collages creates dimensionality and adds an element of the unexpected. Combining encaustic painting with collage has proven to be both challenging and satisfying. The cooling wax has enabled her to bring a distinctive brush mark into the process which she has sought. The results are traditional landscapes created in an unconventional way that always invite a second look.